This group mission is the second of two in Argin-Hiz. 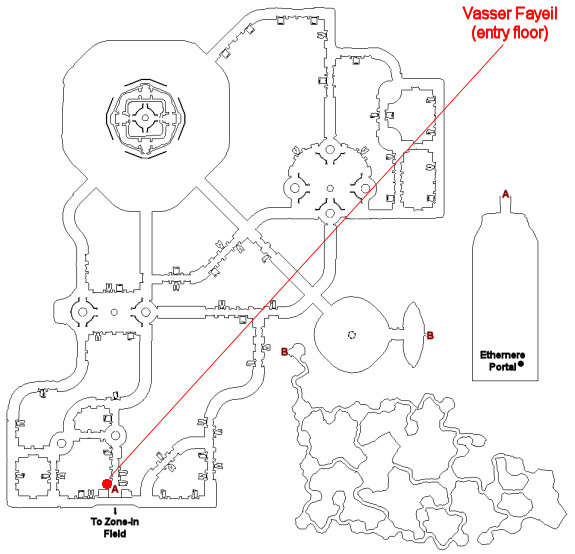 It begins with Vasser Fayeil (click for map image). - Completion of "Burning Curiosity"
- Completion of "The Reclusive Collector"
- Completion of "The Keeper's Ring"
Say "group" to request the task and "ready" to zone in. - Upon zoning in, you'll see six keeper mobs around a flame in the center of the room; four Councilors; and two High Keepers. All mobs are non-aggro. - Speak with Councilor Murant to trigger the event. --- Mobs appear to have zone-wide aggro and assist ranges, avoidable only by line-of-sight. This may sound bad, but given the room setup, line-of-sight is relatively simple to avoid when you need to. --- Likewise, AEs and aura-based effects here can be avoided by remaining out of line-of-sight of the casting mob. --- If, for whatever reason, you decide you'd like to step into the flame in the center of the room, be advised that you'll take about 50,000 dmg every few seconds while in it. --- When the event resets, it's a full reset (must start from the beginning including dialogue trigger). --- Mobs can be left idle for about 45 seconds before the event. ------ As long as you are fighting at least one mob, the event should stay live (so, you don't have to fight everything at once if you can split-pull). --- Regardless of the above, however, if you go about 5 minutes without killing a mob (at least in the early stages), the event has been reported to reset regardless of mob aggro (unknown if this is a fluke, or a bug, or intentional). - Upon event trigger, the keepers become attackable (but are NOT auto-aggro and can be split). These are relatively simple mobs (max hit ~8,500, but hit fast; mezzable; immune to stun). - After the keepers are dead, 12 fire imps appear. --- These do NOT see invisibility and have apparent line-of-sight aggro. --- Four of the imps ("a flameguide") aren't attackable and cast aura-based beams. ------ They direct their damage beams at indicators around the room (similar to the Plane of War anniversary mission) - don't be in their path (or avoid line of sight). --- The other eight fire imps ("a tiny avatar of Ro", max hit ~8,500; mezzable; immune to stun) must be killed to progress the event. ------ These fire imps have a damage reflection buff. - After the eight fire imps are dead, an Efreeti Lord appears in the center of the room. --- Sees invisibility and has apparent line-of-sight aggro. --- Max hit ~15,500; AE rampage. ------ Two sets are believed to be health-based (at around 75% and 50%? - these estimates could be way off). ------ Additionally, he spawns two adds about every 60 seconds. --- He might cast "Tears of Ro" (targeted rain AE) and/or "Fire Whip" (DOT+pull), but if he does, these are avoidable by killing him quickly. --- While the Efreeti is alive, the four remaining imps from the previous fight continue casting their aura-based beam attacks (now occurs every 60 seconds instead of every 35 seconds). - After the Efreeti is killed, the two High Keepers become aggroable. --- See invisibility and have line-of-sight aggro. --- High Keeper Jahar casts "Sol Burst" (PBAE) and "Brain Burn" (single-non-tank-target stun + mana drain). --- High Keeper Arieal casts a 6-second charm and summons timed phoenix adds (about 1 every 4-6 seconds). ------ Phoenix adds are immune to mez/stun; grow in size every 20 seconds, exploding and respawning after growing too big. - For every 1% difference in High Keepers' health, the healthier Keeper gains damage output and the weaker one loses it. --- Melee hits in a greatly unbalanced fight have been reported as 40,000+ or more. - Kill the two High Keepers and all adds to complete the event. You have been assigned the task 'Burn Out'. Defeat the defenders of the Flame of Ro. You have entered Argin-Hiz: Burn Out. There are six keepers of flame in the center. They hit for a max ~8,500; single-target rampage; and are mezzable, but immune to stun. They are NOT auto-aggro (can be split from each other) and do NOT see invisibility. a keeper of the flame has been slain by _____! ...And 12 fire imps appear from above and circle around the flame. After the keepers are dead, 12 fire imps appear: 4x "a flame guide" (non-aggro) and 8x "a tiny avatar of Ro" (aggro). As with the previous phase, these mobs are NOT auto-aggro and do NOT see invisibility. The 8x "a tiny avatar of Ro" each hit for a max ~8,500; have a melee damage shield called "Mischievous Flameshield" (spell data shows as 2,000, but may be smaller in reality). The imps are NOT aggro-linked, but have apparent line-of-sight aggro and large assist ranges. You need to kill all of them to progress the event. a tiny avatar of Ro has been slain by _____! After 8x "a tiny avatar of Ro" are dead, Efreeti Lord Aresh appears in the middle of the room. Efreeti Lord Aresh sees invisibility and has line-of-sight aggro, so be ready for him as soon as you lay eyes on him. He hits for a max ~15,500; AE rampages; and spawns adds. He reportedly spawns 2x "an animated sword" at 75% and 50% health (these are ONLY estimates that could be far off) AND every 60 seconds (timer unconfirmed). These each hit for a max ~8,500 and are immune to mez/stun. He might cast "Tears of Ro" (targeted rain AE) and/or "Fire Whip" (DOT+pull), but if he does, these are avoidable by killing him quickly. While the Efreeti is alive, the four flameguides continue casting their aura-based beam attacks (now once every 60 seconds instead of every 35 seconds). You'll want to kill the Efreeti as fast as possible. Efreeti Lord Aresh has been slain by _____! an animated sword has been slain by _____! After the Efreeti and his adds are killed, the two High Keepers become aggroable. They each hit for a max ~12,000 (their apparent base max hit). High Keeper Jahar casts "Sol Burst" (PBAE for 35,000 dmg) and "Brain Burn" (single-non-tank-target 2-second stun + 22,000 mana drain). a wildfire phoenix swoops down, talons outstretched and ready to strike. Spawn rate seems to be 1x "a wildfire phoenix" about every 4-6 seconds. These adds hit for a max ~10,500 and are immune to mez and stun. They grow in size every 20 seconds, eventually exploding and respawning. As one High Keeper grows weaker, the flames of the other grow much stronger. This imbalance is embraced by Solusek Ro, and is surely dangerous. Far out-of-balance, these mobs have been reported to hit for 40,000 or higher (melee hits). After one of them is killed, the surviving High Keeper retains its out-of-balance strength. Your lack of attention to the battle gives the enemy a chance to recover and reset their defenses. Kill the two High Keepers and ALL adds to complete the event, and then open the chest to finish. High Keeper Arieal has been slain by _____! High Keeper Jahal has been slain by _____! a wildfire phoenix has been slain by _____! a wildfire phoenix squawks as it crashes down in a hail of flaming feathers. An ornate iron chest appears near the place where the Flame of Ro one burned. As the High Keepers die they burn brightly from the inside, their bones turn to ash and harden. The Flame of Ro subsides and seems to invest itself into the hardened bones. You gather those bones, hoping that the flames can later be nurtured and perhaps even controlled. Screams of suffering and loss reach you through the thick walls of the temple. You see the councilors and flameguides become enveloped with flames. Though they do not seem to suffer, they scream nonetheless as the fire leaves them. You can see on their faces looks of betrayal and loss. As the power of flame that kept their souls trapped here, leaves them, they comprehend that they were living a lie that they constructed for themselves. Without the power of the flame, their lives and bodies turn to ash and blow away. As a 110 RoS raid rogue....this quest had always been a thorn in my side. I love solo'ing old quests and this combined with the fall of lord bayle is still hard even years later. Turns out with my RoS AA combined with Jann's Veil, etc. I powered through this mission in 10 minutes. Backstab OWNS the keepers and the last bosses. Efreeti lord was easy with executioners disc. mixed in. Hardest part is still those damage shield imps...Make sure you dump everything rogues fury, twisted chance etc and you can kill them in 2 seconds apiece and partially piecemeal. If you get all 8 on you, you'll probably die. So my buddy and I were doing this to clean up past expansions. After we killed the last two named, we had many adds up. We started killing them off, but on the last two, they poofed and the event reset. I petitioned, as I thought that as long as they were aggroed, the event continued. Killing the adds on the last part before killing the final named will be interesting if that is what is required. I will add to this post if I receive a reply from the GM. While you were killing when the event reset, did you see this emote "Your lack of attention to the battle gives the enemy a chance to recover and reset their defenses."? Yes. It reset on us. GM and petition told me to submit a bug report. Gonna beat the task today. Just beat it. Random circumstances made us kill Jahar first, so we had a race to finish the adds. We did in short time (weren't as many since I nuked the first few that popped. Victory is sweet! Before when it reset on you, did you always have at least one mob on aggro before killing the other? Mobs can be left idle for 45 seconds before the event does a full reset. Suggest putting that lil' tidbit of info closer to the top of the page, like a WARNING label. If you're not prepared to engage all of the trash at once, you might find that any attempts to pull/split mobs will result in sufficient non-agro time to cause a full reset. The imps are fairly wimpy, so it may be a non issue there for some. Taking all 8 keepers at once, however, ouchie. Efreeti spawns 2 adds every minute (60 seconds) which stay up for 30 seconds. He also spawns adds every 20% (2) which stay up for 30 seconds. I am not sure how hard they hit but seems to be a bit more than the actual named. Efreeti is yellow con to a 100 and adds are light blue. First stage - the elves con DB and are HSable. Second stage - the imps.con LB and are not HSable. They are rootable/snareable and do not summon when damaged. this should be second of two? The top of write up says "This group mission is the first of two in Argin-Hiz." but according to the requirements this would make it second to Rings of Fire. Soon as you get the mission it locks, so have to be in group to get credit, no TA\s.